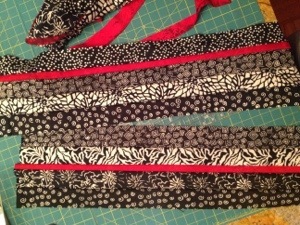 I’ve had two Princess Mirah batik jelly rolls in her red, white, and black color scheme for a couple of years. I couldn’t decide what to do with them. Next week my Innova longarm is arriving and I have been putting together a bunch of tops in advance because I know I’ll go longarm crazy for a few months. Since I need more tops, these two jelly rolls are going to be used today! I have decided to not follow a pattern and just do whatever comes to mind with these. 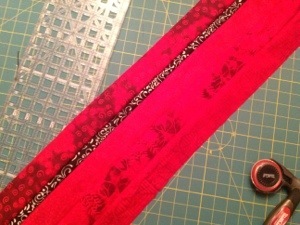 I started by separating out the red strips, and cutting about a quarter of them in half lengthwise. 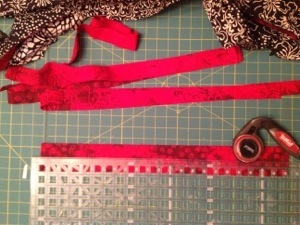 Then I sewed together randomly chosen strips of black and white fabric strips and inset red a skinny red strip randomly. 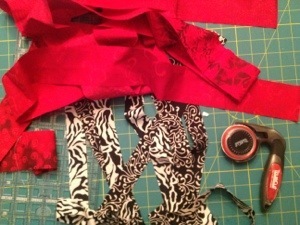 I just used one red per four of the black and white strips. Hmm. I think a bunch of square blocks made up of these units might be boring. So lets chop them up and add a slash of red. I do have all those left over half strips to use up. First I need to figure out what size my blocks need to be. The ends of my striped units are jagged because the lengths of the jelly rolls strips were not the same. The shortest strip was 43.5 inches. 43 minus the selvedges. So I think Imcan get 5 eight and a half inch blocks from each unit. Now I’m gonna be adding some to each block since I want to put random slashes of contrast in them so maybe I can get a little more .nah.. Lets go w five. Off the bat they will be a little taller (9.25) than wide (8.5). But I’ll add more with the slashed and I’ll need to square them up. Let’s see what happens. I slashed all the blocks randomly at different angles. See the leftover jagged end I trimmed off? 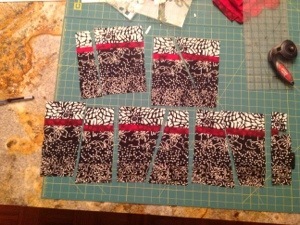 Now to sew in some more of the red half strips and see how it looks. I think its pretty good. It’ll be very interesting when I turn some blocks sideways later. Next Next post: My Innova Longarm has arrived!